Chart of the World on Mercator's Projection. 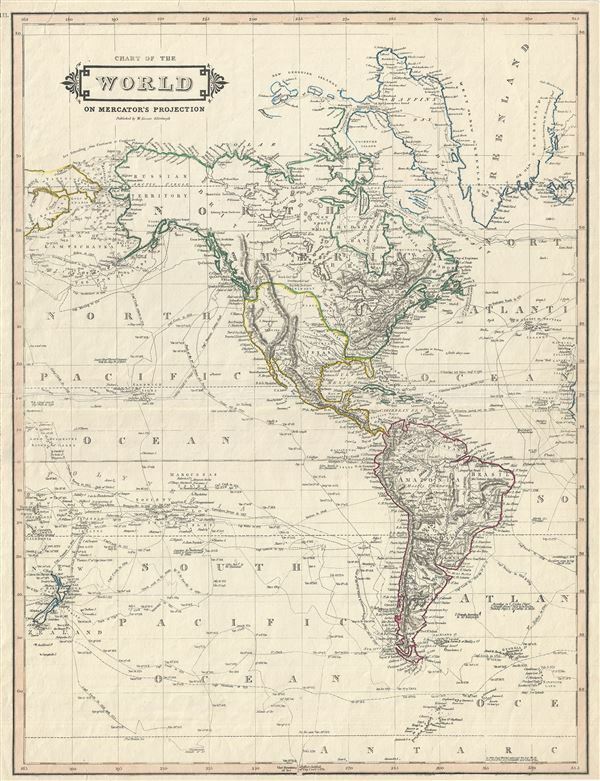 An exceptional example of Daniel Lizars' 1831 map of North America and South America. The map, although titled 'The World,' depicts the western hemisphere including North America, South America, Greenland and New Zealand. The exploratory routes of Cook, Bering (Bhering), Ross, Tasman, Quiros, Parry and others are noted throughout the Pacific and Atlantic Oceans. The region north of the Hudson Bay is tenuously mapped, reflecting numerous expeditions, including those Parry, Middleton, James, and Hudson. Parry's discovery of the New Georgia Islands and Bankes Land is noted. The eastern shore of Greenland is similarly speculative, following the model established by William Scoresby as far north as Gale Hawkes Land. Although the map postdates the Louisiana Purchase, it puts the western border of the United States only as far as the Mississippi River up to St. Louis, then following the Missouri River and turning south where John Jacob Astor had his fur trading post, Fort Astoria, on the Columbia River (although not identified here). Spanish dominions include Florida, Texas (which would soon declare independence in 1836), as well as what was then known as Upper California, as far north as the Columbia River. Some of the political incongruities presented here may be suggestive of British sympathies towards Spanish, rather than American interests. The Great Salt Lake in Utah is here labeled Lake Timpanogos and appears in its embryonic form. Just south of the Salt Lake we find the region of Teguayo. Teguayo was identified as one of the Kingdoms of Gold presumed to be found in the unexplored American west. The name Teguayo first appears in the 'Benevides Memorial,' where it is described as a kingdom of great wealth to rival Quivara, another mythical kingdom which curiously does not appear on this map. The idea was later popularized in Europe by the nefarious Spaniard and deposed governor of New Mexico, the Count of Penalosa, who imagining himself a later day Pizzaro, promoted the Teguayo legend to the royalty of Europe. Most of South America at the time this map was made was struggling for independence. The Spanish colonies won their independence in 1823 led by Simon Bolivar of Venezuela and Jose de San Martin of Argentina. In Brazil, Dom Pedro I became first emperor after proclaiming the country's independence in 1822. This map was drawn and published by Daniel Lizars, for the 1831 edition of his Edinburgh Geographical and Historical Atlas. Hamilton, J., The Edinburgh Geographical and Historical Atlas, 1831. Very good. Minor wear along original centerfold. Professionally flattened and backed with archival tissue.